2. Raise resource and support system awareness. 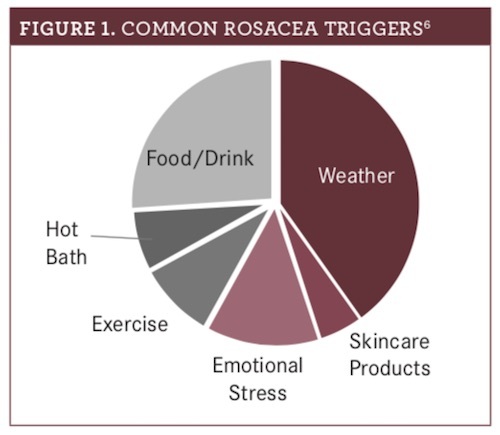 Most patients with rosacea experience depression, embarrassment, social anxiety, and stress. Emotional stress can trigger outbreaks, creating a cycle detrimental to mental health.4 Cognitive behavioral therapy relieves anxiety, a fear of blushing, and stress.5 Social support forums and groups also help patients with rosacea manage the psychological effects. Table 1 lists patient-friendly resources. 6. Recommend mild cleansers and bland moisturizers. 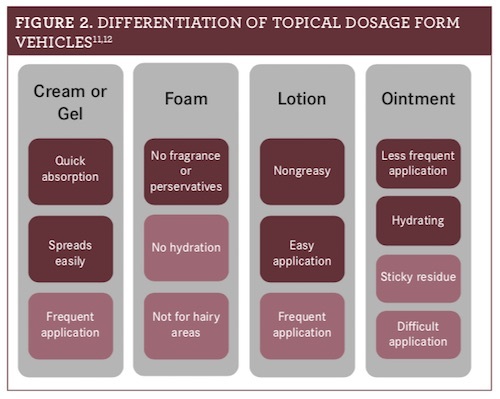 Table 23,13 describes OTC product characteristics. Cleanser. Cleanse first, massaging with fingertips in a circular motion, and avoid abrasive cloths or tools. Rinse the cleanser off and gently pat dry. Medication (if applicable). Apply products with the thin- nest consistency before occlusive ointment-based products.11 Refer to package inserts for medication-specific application instructions. Moisturizer. Wait a few minutes until medication completely dries before gently applying moisturizer. Sunscreen. For the greatest barrier protection, apply sunscreen to dry skin. Sara E. Miller is a PharmD candidate at the University of Connecticut School of Pharmacy in Storrs. What is rosacea? National Rosacea Society website. rosacea.org. Accessed June 27, 2018. Rosacea medical management guidelines. American Acne & Rosacea Society website. acneandrosacea.org/medical-professionals/rosacea-medical-management-guidelines. Accessed June 27, 2018. Del Rosso JQ, Baum EW. Comprehensive medical management of rosacea: an interim study report and literature review. J Clin Aesthet Dermatol. 2008;1(1):20-25. Heisig M, Reich A. Psychological aspects of rosacea with a focus on anxiety and depression. Clin Cosmet Investig Derm. 2018;11:103-107. doi: 10.2147/CCID.S126850. Coping with rosacea. National Rosacea Society website. 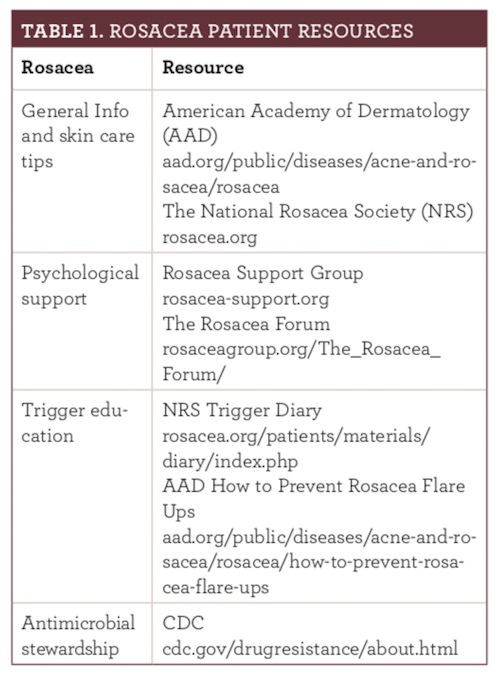 rosacea.org/patients/materials/coping/intro.php. Accessed June 27, 2018. Rosacea diary booklet. National Rosacea Society website. rosacea.org/patients/materials/diary/index.php. Accessed June 27,2018. Litt JZ. Steroid-induced rosacea. Am Fam Physician. 1993;48(1):67-71. 6 rosacea skin care tips dermatologists give their patients. 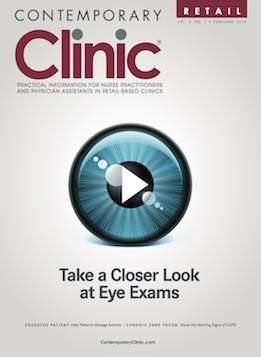 American Academy of Dermatology website. aad.org/public/diseases/acne-and-rosacea/rosacea/6-rosacea-skin-care-tips-dermatologists-give-their-patients. Accessed June 27, 2018. Subramanyan K. Role of mild cleansing in the management of patient skin. Dermatol Ther. 2004;17(suppl 1):26-34. Ballington DA, Anderson RJ. Principles of Pharmacy Practice. 5th ed. New Gloucester, ME: Medtech; 2014:59. Wehausen B, Hill DE, Feldmen SR. Most people with psoriasis or rosacea are not being treated: a large population study. Dermatol Online J. 2016;22(7). Draelos ZD. Cosmeceuticals for rosacea. Clin Dermatol. 2017;35(2):213-217. doi: 10.1016/j.clindermatol.2016.10.017. Oracea (doxycycline) [prescribing information]. Fort Worth, TX: Galderma Laboratories LP; 2013. www.accessdata.fda.gov/drugsatfda_docs/label/2013/050805s008lbl.pdf. Accessed July 5, 2018. Weinkle AP, Doktor V, Emer J. Update on the management of rosacea. Clin Cosmet Investig Dermatol. 2015;8:159-177. doi: 10.2147/CCID.S58940.